IPP Bruce, filling in for Pres. Allan welcomed everyone and had the guests introduce themselves, including Aaron Huges from the Bali Children’s Project, David Meldrum, our guest speaker Ron Lilley, and Marie from Quebec, Canada. Bruce officially welcomed our newest member Raelene Starr, and read correspondence from her regarding her acceptance of her honorary membership. She said how proud she was to finally being a Rotarian and thanked us all so much. Our other wonderful Honorary member, Anne Marie, has contributed another incredible wall hanging for us to auction off. It is antique batik and semi-precious stones. Bruce has created a special Auction Page on our website for this and future auctions. 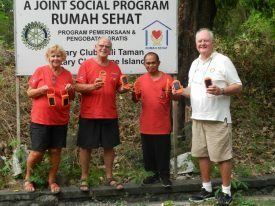 Please look at http://rotarybaliubudsunset.org/club-auctions/. She donated it to raise funds for the Mt. Agung evacuees and we thank her. The minimum opening bid is 2.5M and the auction will run until 30 Nov. so get those bids in soon. Bruce was excited to announce that our 4th Annual Christmas Fundraising Buffet Dinner at the 5 star Maya on 10 Dec. 6-10PM, will proceed as planned. We now have 30 reservations with 5 weeks to go and have received raffle donations totaling over 42M IDR with a few more to come in! We will start our marketing this week with emails to all the Rotary Bali clubs, articles to be included in the Bali Advertiser; a print ad of our poster in the Bali Advertiser. A Facebook Event; other social media sites and local web sites. Community Services Director, Dora handed out the tickets to members. They consisted of our club business card with club information on one side (email address, web site and Facebook pages, etc). On the other is the actual Dinner tickets. It includes the person’s name and how many of each ticket type they wish (BTW, misprint – the under 12 children’s price is 300k not 3000k!) It is highly recommended that members give one card to anyone interested and ask them to call the Maya to purchase their tickets, their phone number is on the card. By calling the Maya they can either charge the tickets or get information about bank transfers. IF the person still wants to pay cash, they can give it to the member and then 2 cards are filled out. One is given to the guest and the other one the member keeps along with the cash to be given to our Treasurer Brian. 2. A water project for Rumah Sehat, costing approximately 30,000.000, since it is a deep bore well. This will support all the evacuees that they are currently taking care of. Sue will produce the written quotes for the project. The club and board members present voted unanimously to approve the Rumah Sehat water project and Dora and Sue will work on producing all the documents needed by the District. Dora also announced that our club’s Roteract activities are on Saturdays at the Sukawati football field at 3pm for English classes. All are welcome. Next Bruce announced that to keep our meetings fresh we will occasionally have meetings at different venues. Our next meeting, on 13 Nov. will be at the beautiful Pyramids of Chi in Ubud and will include a free 20 minute demo of their Ancient Sound healing. (#22 Jl Kelebang Moding, PH: (+62) 361 9000717) (Directions: north on Jl. Suweta 3 kl, left at Jl Kelebang Moding (a Pyramids of Chi sign), short drive)) The meeting will start at 5:30 and run until 7PM and include the demo. We also have a special guest speaker that night, David Meldrum who will tell us about mental health challenges in Bali. How Indonesia is dealing with serious mental illness. Then Aaron Huges, of the Bali Children’s Project, thanked our club for their support of the school sponsorship program with an explanation about how the funds would be used. As part of last year’s District Grant we are funding 20 students with one year’s worth of the items that they must have to attend a school, including: several uniforms, shoes, hats, backpack, books, pencils and papers). Without this help these deserving children would NOT be able to attend school. Sue had some Rotary patched made up which he will attach to each backpack. Raffle prize was won by Danielle Foss and was a beautiful handbag. Our next meeting Monday 13 November at the Pyramids of Chi 5:30-7PM. Direction above. Our guest speaker will be David Meldrum who will tell us about mental health challenges in Bali.